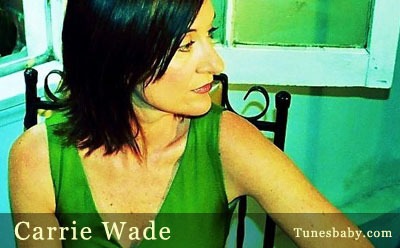 Carrie Wades songs folk, rock, country and POP! She's performed, recorded and toured with a number of original music bands and is now focusing on her own material. Successfully working her impressive craftsmanship alongside her happily active imagination, Carrie manages to create songs that are simultaneously radio viable and unpredictable - her choice of chords and progressions, lyrics and phrasings, pleasing to the ear while fresh and often times provocative. I think of it as Alternative Pop Music, and I say Pop Music with a nod to the way the Pop Music moniker was originally intended to be understood - popular music of the day. I preface Pop with Alternative because many an artist and listener today wouldn't necessarily get what I mean and would go running for cover assuming I meant it was fluff or bubblegum - and this is SO not that - haha! I also say Alternative because I truly feel it would fit neatly into that category as well. Carrie is presently in the studio working on what will be her debut CD to be entitled "The Old Ways". IndieHeart (www.indieheart.com/podcasts.php) is airing her regularly on their podcast shows through Itunes (The Heart of the Night and The Transatlantic Acoustic Shows) as well as on CBS/Infinity San Francisco Radio Station KYOU (www.kyouradio.com - KYCY AM 1550 on the dial). Carrie is finding very open arms at Internet Radio. Her song "It's Just Blood" is currently No. 1 on KIAC's (www.iacmusic.com) Pop Chart and the song reached No. 14 on their Big 50. There at KIAC, several of her songs are receiving play on approximately 35 different stations. GuitarGirls features her on their station at KIAC as well as on their myspace site (www.myspace.com/guitargirls). NETTE Radio (www.netteradio.com), The Feminine Groove program at Engage Radio Worldwide (www.evolvingartist.com), TunesBaby (www.tunesbaby.com) and JeRQ-This (www.jerq-this.com) have all become happy homes to her compelling music. "Its Just Blood" is now available on CD on Indivisible Productions Los Angeles Independent Artists November 2005 Compilation (www.indivisibleproduction.com). Carrie Wade's song "It's Just Blood" is currently nominated for "POP SINGLE OF THE YEAR-2006" by the Los Angeles Music Awards!